I've mentioned before the difficulties I have laying out quilt tops at home. Living with my bestie in a 1 bedroom apartment converted to a 2 bedroom makes floor space limited. 650 or so square feet of us, the cats, and our stuff. I've worked to find ways to peice tops together while living here. Most often, I lay them out at my friend Megan's house, who has ample floor space. Other times, I just have to make it work with the space I have. My current method is using a flannel table cloth or quilt of some sorts as a design wall. Or, rather, I should say design floor. For smaller tops, I can usually lay out on top of one of the beds with a little effort. Here I have Isa's quilt laid out on Bestie's bed. Under the blocks is a flannel quilt (you can see the back of it to the left). I laid it out and played around with things until I was happy with they layout. I then carefully folded and rolled it up to make it easy to move. Here is just a close up of the blocks I have together. This is for my niece Isa, who is going to be a big sister any day now (or Thursday, whichever comes first!). I started this for her birthday last month and moved to making it for her "Big Sister" day after having some medical stuff slow me down for a couple weeks. I doubt I will have it quilted and finished by Thursday (laying out quilt sandwiches can't be done well in this apartment) but it should be done sooner instead of later. I'm not sure if we really have a heat wave, but it is in the upper 90s here. It is hot! It is humid! And it is time to get some sewing done. My summer course is finishing (just have final papers to get and grade) so I thought it was a good time to figure out what I have going on. First, I have my "to quilt" pile. Still hanging out but you might notice it is smaller. 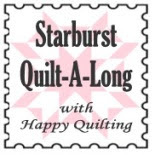 That is because I finally got my STARS QAL top quilted! Here is the top - I'm working on hand tacking the binding. I'll do a post when I get that one finished but it looks really nice. You can also see that Bobby is back in action. He was very happy to come home and is working better then when he was new out of the box! I also have my blocks slowly coming in for Beejeebers. I have them in a pile on the board, waiting for the design wall to clear off so they can be laid out. I might just get another wall going for them since the project on the wall took a while to lay out. So far I have 2 blocks in plus a couple I made. I know a couple are in the mail. This has been a really fun Bee! And now, because I don't have enough WIP, I am working on getting a top together for my niece. Her brother is due any day now so this is a late birthday/big sister quilt. It will be fast to get together. It is just the "getting to" getting it together has taken some time. I'm using some orange/brown/pink prints from quilters showcase since she likes these colors. I'm doing the X/O pattern. What is that really called? Who knows? Everyone calls it what they want! So that is it for now. Good thing I don't need to iron much today! This is my month for Beejeebers and I picked the mod mosaic block from Elizabeth Hartman's site Oh, Fransson! I couldn't pick a set of colors and decided that the sea colors of the previous month looked really cool so I picked them again! Greeny yellows, teals, blues, and some grey for fun. I started my block. I'm sewing on NB since Bobby is still at the shop. However, he is done and ready to be picked up! If only Gloversville was much closer to me than it is... but that is besides the point. I picked out some scraps and started to play with them, looking for some ways they would fit together. Here is the layout I'm working with. I got lucky in the scrap bin - only had to cut the greys from fresh stash. That was one color I don't have a lot of in the stash since moving to higher quality fabrics. Interestingly, grey is my favorite color. Seems I don't make quilts for myself enough! What a nice little block! Once I get the sections together I will put them all together. This is a new technique for me but I'm having a lot of fun. 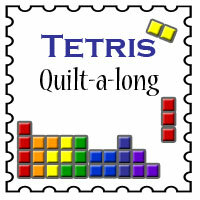 I am planning to do the quilt double sided, with floating blocks on both sides. I want to use some really fun colors for the background - perhaps a nice aqua on one side and a citron on the other. I'll have to see when I get my blocks in what colors seem to want to shine. I finished the postage stamp top. Now I'm debating if the Kona Khaki is too dark and if the boarders are too wide. Pro for Khaki: Friend receiving this has a dog. Hides stains better? Also, could be the lighting. Doesn't seem this dark in person (advantages of tiny apartment? That is my bestie standing on her bed holding the top up. Does the trick when it is raining). What does everyone think? Are the boarders too wide? That is an easy fix. The color... most as much but still doable! My bestie made this quilt. It was her first. I suggested a less complex pattern, especially since she isn't very experienced with machine sewing. However, she poo-pooed that idea and went for this one. She made the top and I did the quilting and binding. I'm very please with how it turned out! The block is called Jack in the Box and these finished at 12" square. I really like the combo of red, blue, gray and cream on this top. Not too bad!